The lovely and super sweet Laurie sent me a FQ bundle of her fantastic Modern Whimsy line and I improved this quilt top with the help of a few solids. I knew what I was going for, but I didn't stop to plan or measure anything until the very end when I had to join the middle section to the sides. I tried a new-to-me quilting style for this one. I free motion quilted little loops randomly over the entire top. My friend Melanie, aka, the quilting guru, gave me the idea. Her first idea was to quilt random bubbles, but I'm not so good at random so this was her second idea. The quilting went really smoothly, but I was still unsure about my choice until I posted some pictures on Flickr and got some reassurance from my friends it looked ok. I guess trying something new is a bit scary and I start to self doubt. For the back I used an Amy Butler Soul Blossom print that matches really well with the Modern Whimsy! I was pleasantly surprised! This quilt is now listed in my shop. I have a coupon code good through February 14th for 14% off anything in my etsy shop! Just enter "SEWMAMA" at check out! 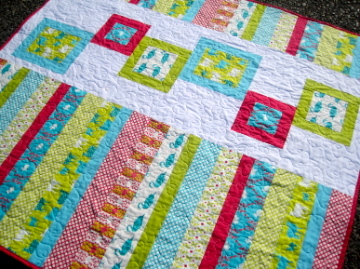 Love the quilting, actually love the whole happy thing! 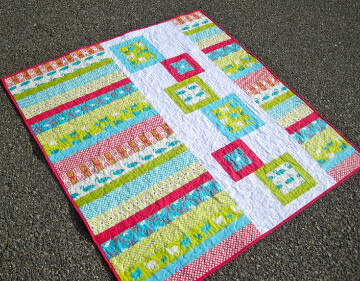 Oooh, love it, and the quilting is fab on it! I love Laurie's work, and this line is no exception! You picked a very fun layout to show off the fun prints! oh Kelly! you are so cute! 14% off everything! such a great idea! love the quilt. i think you picked the perfect pattern to showcase that fabric! i love the quilting also. so so cute! 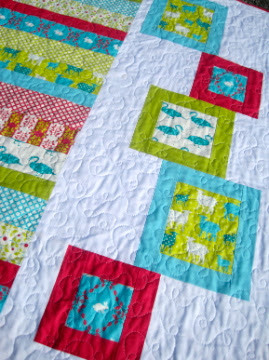 this is a very cute quilt and your double hour glass is fantastic! It's hard to believe you made this with a single FQ bundle. I absolutely love it. I couldn't pass up a fun FQ bundle the other day and hope to make something like this in the near future. Not sure if I'm brave enough to attempt the free motion quilting yet. 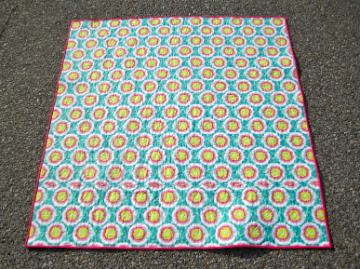 Is there a pattern available for this quilt?